By posting this recipe we are entering a recipe contest sponsored by Potatoes USA and are eligible to win prizes associated with the contest. We were not compensated for our time. * Potatoes provide the carbohydrate, potassium, and energy you need to perform at your best. * Potassium is an important electrolyte that aids in muscle, cardiovascular and nervous system function. A medium potato with the skin contains 620 milligrams of potassium: more than a medium-size banana! *Carbohydrate is important for optimal mental and physical performance. 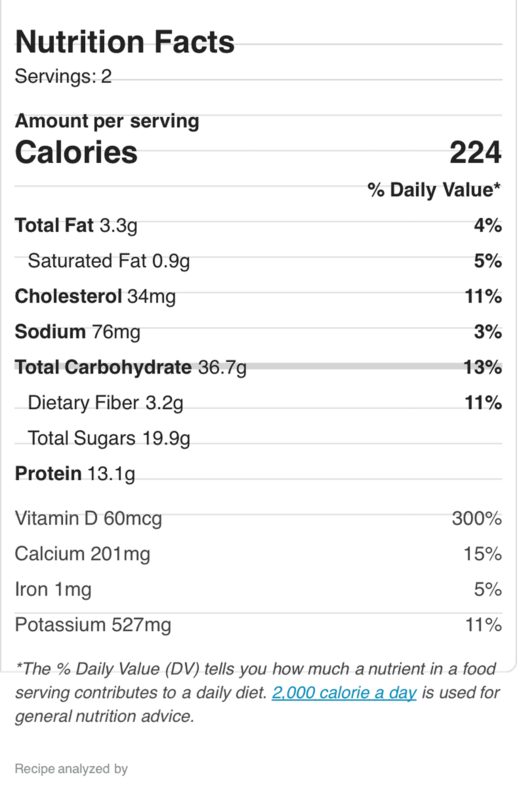 A medium potato with the skin has 26 grams of quality carbohydrate. With as much — if not more — of several essential vitamins and minerals found in spaghetti, brown rice or whole wheat bread, potatoes are a smart addition to your other favorite performance foods (compared on a per-serving basis). Need more reason to try a potato before a workout? Blend them in with fruit and a good protein source and you’ve got yourself the perfect, sweet snack. What qualifies as a pre-workout snack? Of course, not only do we need to convince you, but had to convince our harshest critics. On a day we trekked out to Fairyland, we gave these little fairies the smoothie. Not only did it taste just like strawberries and cream, but it also provided the essential vitamins, carbs, and protein they needed to fuel their fairy needs. One serving provided 50 mg of vitamin C! For your reference, the RDA for children ages 4 to 8 years is 25 mg/day, and the RDA for boys and girls ages 9 to 13 years is 45 mg/day. These fairies are VERY picky and they could not detect the slightest hint of potato flavor. Yet, they benefited from all the high quality nutrition of the potato ingredient. It also filled them up so that they wouldn’t reach out for less healthy, salt-and sugar-laden concession treats. The smoothies gave our fairies the energy to enjoy Fairyland to its full potential. It also gave us moms the stamina to keep up with these high energy fairies as we walked and climbed our way through every nursery rhyme scene. We were so thrilled at how these smoothies tasted that we’ll be incorporating them into our pre-workout routines from now on. Our kids requested that we serve them prior to their after school sports practices as well. Success! Don’t be afraid to try this recipe…you and your kids will be pleasantly surprised by just how sweet a potato smoothie can be! Perfect drink to fuel you for your exercise, this smoothie is delicious and healthy! Scrub potato well. Microwave for 1-2 minutes until soft. Discard the peel. Place everything in a blender and blend thoroughly. Serving size is 1 cup (8oz). What cute fairies! Will give this a try- love that it’s also gluten free. Love all the pics of your cute kiddos! Wow would’ve never thought to try this combo but had all the ingredients on hand and it was amazing! Thanks! Love that you tried these out on your kiddos! I have to try this – intrigued.. This was so yummy! My kids and I loved it! My kids and hubby LOVED this! And we have a huge bag of potatoes to use up…score! Wish to see this much more like this. Thanks for sharing your information!